An Excel worksheet has too many empty rows between the heading and the contents. You don’t like this and want to delete an empty row. There is also a column with sales in British Pounds in your table, which you would like to remove. 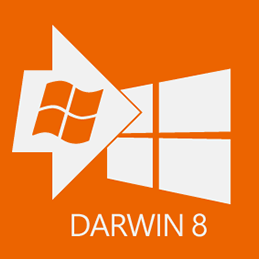 In this learning module “Excel delete rows” you will learn how to delete rows or columns. Excel delete rows: HOW DOES IT WORK? Before you delete cells, rows or columns from your table, you have to select them first. On the Home tab, in the Cells group, click the button. A click on this button will delete the rows, columns, or cells selected. You can also delete one or more cells in the same way. Select them and click . The selected cell or cell range will then be deleted. Cells will be shifted upwards into the gap created. You can also delete a cell, row or column by selecting a cell within the row or column you want to delete, and then clicking the arrow on the button. As your next step, select whether you want to delete the selected cell, or the column or row where the cell is located. If you want to delete an individual cell and fill the gap by shifting the cells on its right to the left, select this option. 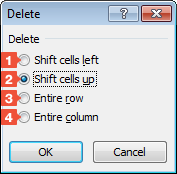 If you want to delete an individual cell and fill the gap by shifting the cells below it upwards, select this option. 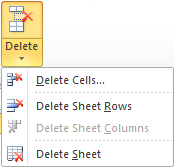 If you want to delete the entire row where the selected cell is located, select this option. To delete the entire column where the selected cell is located, select this option. 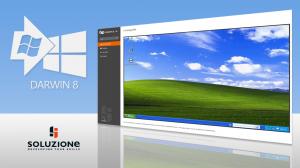 You can also delete cells, rows, or columns with the [Ctrl]+[-] key combination.